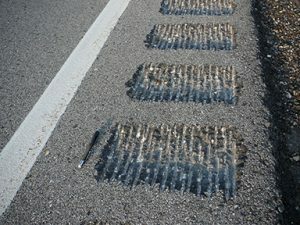 Rumble strips provide audible and vibratory alerts to drivers whose vehicles have departed the travel lane and warns them that a steering correction is needed. 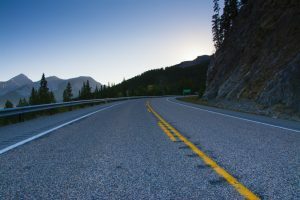 Shoulder rumble strips are narrow, linear bands of indentations (bumps) installed between the travel lane’s edgeline and the paved roadway shoulder. Edgeline rumble stripes are a particular subset of rumble strips installed on the pavements’ edgeline. 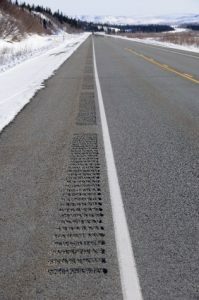 Rumble strips provide audible and vibratory alerts to drivers whose vehicles have departed the travel lane and warns them that a steering correction is needed. The treatment can be installed on new or existing pavements. 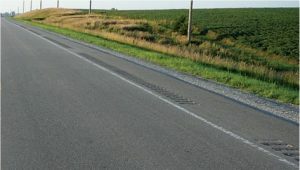 Centerline rumble strips (CLRS) are transverse grooves that are placed along the centerline of a two- or four-lane undivided roadway. These devices can be installed on new, existing, or reconstructed asphalt or portland cement concrete (PCC) pavements. cross-centerline multi-vehicle crashes at a relatively low cost. More information about shoulder rumble strips is provided in Chapter 3 (PDF), and information about edgeline rumble strips is provided in Chapter 4 (PDF) of Lane Departure Safety Countermeasures: Strategic Action Plan for the Iowa Department of Transportation (PDF) (Nambisan and Hallmark 2011). A summary of crash modification factors for shoulder and centerline rumble strips is provided here. Nambisan, Shashi and Shauna Hallmark. Lane-Departure Safety Countermeasures: Strategic Action Plan for the Iowa Department of Transportation, Institute for Transportation, Iowa State University, 2011.